The novel, Texas Indiana II, is the second story developed from the author’s first book, Ripples in the Wind. The plot continues to chronicle the struggles and challenges facing a wealthy Indiana family. The story focuses on Barbara Callahan, a successful and wealthy businesswoman coping with the loss of her husband. Under the guidance of her retiring father Raymond Morrison, she accepts the position as CEO of her father’s corporation; Morrison, Inc. Barbara strives to overcome the obstacles that confront her and her family. Barbara must balance her role as head of the family and CEO of a powerful business. She struggles to find her inner strength to overcome the challenges that come with her responsibilities. In the business world, Barbara must prove herself competent in the eyes of those questioning her new position. In her family, she struggles with the maternal instinct to protect her children and allowing them to confront and resolve their own problems. Her son James finds himself tackling alcoholism and the challenges he faces as he fights to save his family. Her daughter Jennifer, a smart woman businesswoman, but naïve in matters of love, faces a relationship that proves to be a danger to her and her family. As the CEO of Morrison Inc, Barbara is confronted with those seeking to control her and her company. As she uncovers a sinister plot from within to steal from the company by individuals seeking to keep the truth from her at any cost, she faces a threat with potentially fatal consequences. Barbara and her family become embroiled in dangerous plots designed to hurt her family and business. Texas Indiana II tells a tale of love, loss, intrigue, and suspense that tests the endurance of a family confronted with external and internal influences threatening to destroy their lives. Extortion, revenge, betrayal, and greed, are key plots accompanying the many twists and turns throughout the story. It is a charming and enthralling tale of self-reliant growth of a woman in the face of the many obstacles seeking to ruin her corporation and family. 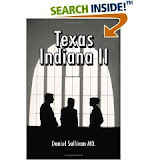 I highly recommend Texas Indiana II to readers who enjoy a well-written and engaging story of growth and survival. 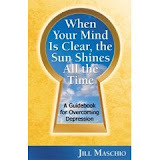 Jill Maschio's book, When Your Mind is Clear, the Sun Shines All the Time: A Guidebook for Overcoming Depression takes readers on a personal journey into the murky waters of depression. Written by a survivor afflicted with deep depression for many years, the author shares a candid story about her personal battle with depression. She shows how she came to understand it, face it, and overcome it. Maschio explains that the key to overcoming depression is "critical thinking." She demonstrates that critical thinking involves taking the time to challenge your feelings and thoughts instead of reacting to them. The author delivers key tools to becoming a successful critical thinker allowing one to develop positive decision-making abilities. By analyzing your thought processes during difficult times and recognizing flawed thinking that can lead to misinterpreting events, she shares how you can head off the path to depression. Readers learn to challenge many influences, internal and external, and develop the ability to question their validity by looking at them from other points of view before jumping to conclusions. Rationalizing plays a key role in critical thinking. Maschio provides exercises gathered from various authors with experience on a variety subjects in the book including her own self-help exercises. Teaching readers how to assess a situation, the author offers ways to look at things differently thereby engaging in positive decision-making. Readers learn how to recognize when decision-making is the result of an emotional response, which is a fundamental tool to becoming a critical thinker. Various techniques that include relaxation, active listening, the benefits of forgiving others and ourselves, as well as using "Maslow's Hierarchy of Needs," help to gain insight into overcoming depression. With constant reflections of her own inner struggle throughout the book, Maschio shows readers how to apply critical thinking to constant negative thoughts. She delivers an understanding of self-esteem, a logical look where self-esteem originates, the effects of low self-esteem, and how to master the art of raising it by employing critical thinking. Jill Maschio's guide to overcoming depression stands out from many self-help books because it is told from the perspective of a survivor. It delivers hope to those believing life is hopeless. With over 57 million people in the US suffering from depression, the author demonstrates that we all have it in us to "walk through fear" to break free from the constant cycle of negative thoughts and achieve self-discovery. Roland Hughes’ manual, The Minimum You Need to Know About Java on OpenVMS, is the second book that builds on his first book, The Minimum You Need to Know to be an OpenVMS Application Developer. Java is an object-oriented programming language that borrows much syntax from C and C++ but has a simpler object model and fewer low-level facilities. In this second book, Hughes creates and demonstrates the tools you need to make Java a usable language on OpenVMS. The author delivers an in-depth guide to overcoming the problems C/C++ programmers have with Java. He notes that the problems many have with Java are rooted in syntax and where the language came from. Because the creators of Java wanted it to be a pure OOP language, Hughes explains that in Java, most things are classes. Although appearing similar in C and C++, it is not. Java has a unique class called an Array and no defined constructor. This means values can be stored anywhere and in no specific order. In a carefully crafted and illustrated order, Hughes presents a step-by-step manual to implementing Java for more application development on OpenVMS. He points out that successfully using Java on OpenVMS requires the development of a Free Class Library. Programmers learn how to create a Class Library developed in the OOP language. As well, Hughes shows how to write Java classes using the Java Native Interface (JNI). As in the previous book, Hughes rewrites the same application (mega-zillionaire application) with each new tool. After developing the application with Java, FMS, and RMS indexed files, he redevelops the application in this book using Java with FMS and RDB. Giving systematic and easy to follow instructions, programmers learn how to build infrastructures while at the same time building the application. Readers are shown how to develop a generic class that will be usable by Indexed Files. Hughes demonstrates how to use JNI to access RMS, FMS, system services, and operating system provided libraries. As well, programmers learn to create an infrastructure MMS Procedure and how to use the supporting classes the procedure creates. Hughes shows how to access RDB by way of the JDBC driver highlighting the importance of SQL. The CD that comes with the book contains the Full Class source. Well-illustrated examples with detailed analysis, descriptions, and definitions, allow readers to follow the book while working with the server, thereby learning how to implement and operate Java on OpenVMS. Each chapter details troubleshooting tips, error handling tips, as well as providing exercises to enhance understanding of the tools. With plenty of expertise, the author presents Java with all its advantages and pitfalls while often comparing it to C++. Together with easy to follow instructions, detailed examples, and an informative chapter on the future of IT, I highly recommend the book as an asset to computer programmers and those entering the IT field. OpenVMS (Open Virtual Memory System) is a high-end computer server operating system. As a multi-user, multiprocessing virtual memory-based operating system (OS), it is designed for use in time-sharing, batch processing, real time, and transaction processing. It offers high system availability through clustering and distributes the system over many machines. The ability to distribute both the application and a single transaction across multiple nodes is the heart of clustering; otherwise, it is just networking. Roland Hughes’ book, The Minimum You Need to know to be an OpenVMS Application Developer, offers Computer Applications Developers, Consultants, Systems Analysts, and developers switching to OpenVMS, a detailed and informative companion guide to understanding and implementing the applications and modules needed to operate and maintain OpenVMS. From logging into OpenVMS, each chapter charts a systematic guide to operating and sustaining the application coding and programming of essential modules running on OpenVMS. Such languages, tools, and databases as DCL, DEC BASIC, FMS, COBOL, CDD, FORTRAN, C/C++, MySQL, and RDB cover the heart of what you need to know as a maintenance programmer. Using a created lottery tracking system, Hughes generates a single application and develops it in each of the following: DEC BASIC, FORTRAN, COBOL, and C/C++. As well, Hughes shows readers how to use CDD, CMS, and MMS with these languages. By repeatedly applying the same method in different languages, Hughes demonstrates in a clearly written and easy to follow guide, how a programmer knowledgeable with one language can become skilled in others. The CD-ROM that comes with it contains the source code developed in the book allowing readers to learn the advantages and disadvantages of each language. Well-illustrated examples with detailed analysis, descriptions, and definitions, allow the reader to follow the book while working with the server, thereby learning the “nuts and bolts” of creating, understanding, and managing command files. Each chapter details troubleshooting tips, error handling tips, reducing debugging time, as well as the Do’s, and Don’ts of writing applications. Following each chapter, there are exercises to enhance comprehension of the modules and applications in OpenVMS. With a wealth of experience, Roland Hughes provides thoughtful and knowledgeable observations about the IT field. One important bit of knowledge he conveys: “IT is a way of life, not a job.” With easy to follow instructions and detailed examples, I highly recommend this informative and well-mapped book as an asset to those in the IT industry, as well to students entering the computer-programming field. Denise Skelton’s, My Angel, tells the story of an interracial budding romance between Simone Porter and Matt Turner. Brought together by a tragic car accident that left Matt Turner in a coma for months, Simone and Matt develop a deep and spiritual friendship. Emotionally shut down after having his heart broken when his wife left him for another man, Matt finds himself drawn to Simone’s innocence, beauty, and unconditional kindness. Matt and Simone confront outside influences seeking to keep the two apart. In a society where traditional parental values clash with the free spirit and modern ideals of youth, Simone and Matt struggle to find themselves as well as their love for each other. Matt’s friendship and attraction to Simone forces him to reflect on his past marriage and notions of love. His ex-wife‘s ordeal with the jealous and dangerous man she left him for develops into a deadly threat for both Simone and Matt. Matt and Simone face many obstacles, internal and external, on their journey to finding the meaning of true love. Simone’s mother, an overbearing and controlling matriarch, dominates and influences every aspect of Simone’s life. From what she should eat, to what type of man she should date, Simone feels constantly scrutinized. Matt struggles with an outspoken and bitter father attempting to influence his children’s lives. Class, race, and sexuality are predominant themes throughout the book. My Angel is a wonderful story about finding true love amid a struggle to find one’s identity in the face of traditional struggles of class, race, sexuality, and the traditional roles of men and women compared to the untamed spirit and independence of modern youth. Issues raised in the story often take place today giving readers a unique and engaging approach to resolving such conflicts. With family drama and a heated romance, My Angel is a definite page-turner. I highly recommend this well crafted story to lovers of romantic tales embroiled in family interference, societal influences, and internal struggles that challenge the human spirit.